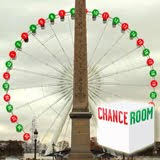 ChanceRoom.com has turned the giant Roue de Concorde into a monumental roulette wheel for a free game designed to prove that the France/UK-facing online casino site is serious about fun. Until 24 January only, the iconic ferris wheel on the Place des Concordes in Paris will spin like a roulette wheel and contestants will win cash prizes for guessing which number it will stop on. This special event is being coordinated by the same French PR firm that helped ChanceRoom help save Parisians from le grippe (the flu) by handing out free face masks on the streets of Paris this winter. ChanceRoom.com is a unique igaming site with online casino, poker and sports betting all accessible with one account and with one wallet. Software provided by GTECH G2 gives players an amazing selection of games and connects them to Europe’s largest poker network. ChanceRoom.com launched French and English versions of the site last fall.